Ever since joining the Urban Initiatives team in January of 2015, Nikesha Drummond has had a huge impact on the organization and all of the kids she has coached as an Assistant Coach with the Reavis Work to Play team. Working as a health professor at a local college in Chicago, she already recognized the importance of programs like Work to Play. After her son joined the team, she quickly became a consistent volunteer. Then, in November of 2015, she became an Assistant Coach at Reavis. She and her son, who is an only child, have always been very close and both being on the Work to Play team is another thing they get to share and spend time doing together. However, during practices and games, she insists that he call her Coach Drummond, not mom. He invites her to a lot of his activities, including Taekwondo classes, which is another great way to stay healthy and active. For example, he will make sure they are both drinking enough water in a day or eating the right food groups for every meal. 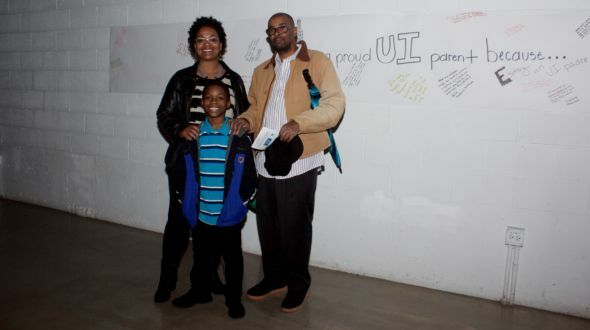 She believes that being involved with Urban Initiatives has had profound impact on her son. It has helped him learn how to play with others and to realize that you cannot be the best at everything. He has also learned that it is okay to fail, and from failure you will learn something new. One of Coach Drummond’s favorite things about UI is the commitment they show. Every week, she has practices on Monday, Wednesday, and Thursday, just like clockwork. She also loves that the program consistently sends the kids home with something, let it be fruit, soccer balls or an actual plant. She believes it teaches the kids a lot about discipline too. They know that if they do not do well in school or are having bad behavior they will not be able to participate with their teammates for that week. In addition, she feels that UI has had a largely positive effect on their school community and in many communities across Chicago. Being on a team helps students learn responsibility, cooperation, and teamwork; three things that are essential building blocks for a community. At the same time, children are being taught how to live an active lifestyle by eating healthier and having a positive outlook. Once UI kids learn something, they can share it with others, like their family or neighbors, creating the ripple effect. Others will then learn it, share it with someone else, and this cycle will continue, sometimes with a creative new twist on whatever is being taught. In her opinion, if everyone has this same mindset, a community can be saved. She also believes that if more children were preoccupied with activities like sports, they will be less likely to get distracted and do things like hurting others or joining a gang. It is great having such committed parents and coaches. We thank you and your Work to Play team does too!